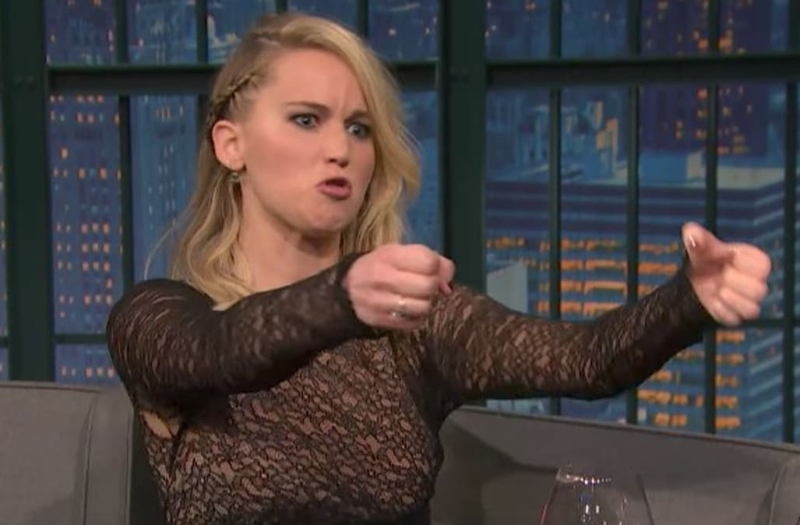 On "Late Night with Seth Meyers" Thursday, Jennifer Lawrence revealed she got into a "bar fight" in Budapest after refusing to take a selfie. Lawrence, who was in Budapest shooting her new spy film "Red Sparrow," went out for drinks with friends one night and was asked repeatedly by a fan for a selfie. According to the actress, after she had declined to take a selfie with the fan, he said, "F--k you." Lawrence, enraged by the fan telling her off, chose to douse him and his luggage in beer. A celebrity being pestered for a selfie is far from news at this point. Lawrence is just one of many celebrities unable to get away from the never-ending stream of selfie requests. According to late-night legend Conan O'Brien, the smartphone selfie has changed everything for celebrities — and it's not a good thing. "The only thing that's changed is the selfie," O'Brien said on a Vanity Fair podcast earlier this year, while discussing being famous in the digital age. "The selfie has changed everything. Ask any person who is known and the first thing they'll talk to you about is the selfie." One big problem is that once one person asks for a selfie, suddenly everyone else in the vicinity wants one as well, according to O'Brien. It spirals out of control. Unfortunately for celebrities, it doesn't look like smartphones or selfies are going anywhere any time soon.